Wedding PR: Bridal Guide, Travel Channel, WeddingIQ and more! Another Monday means another roundup of our fabulous clients’ roundups! From Bridal Guide to WeddingIQ, we’ve got tons to share. Take a peek below. 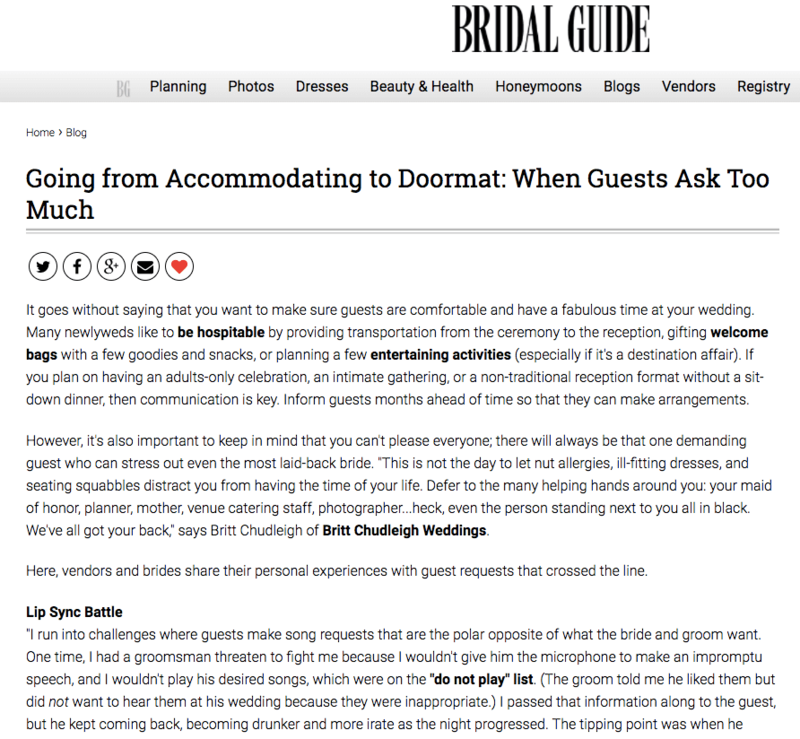 Fantasy Sound Event Services and Taylor’d Events Group were featured in the Bridal Guide article Going from Accommodating to Doormat: When Guests Ask Too Much. See the full feature here. Be Photography, Destination Weddings, Cocoon Events Management Group, Mike B Photography, Passport to Joy, and Taylor’d Events Group on were featured in the Travel Channel article Expert Tips for Destination Weddings. See the full feature here. 100Candles was featured on Honeybook with their guest article 3 Tips for Staging Products. See the full article here. Belladeux Event Design was featured on Catersource with her guest article Fall Design Ideas. See the full article here. Where Will They Stay? was a guest on the Bridechilla Podcast discussing hotel booking and travel. Listen to the podcast here. 100Candles was featured on AllSeated with their guest article Using Candles to Spice Up Your Event. See the full article here. Fantasy Sound Event Services was featured on Special Events with his guest article Building Wedding Referral Business in the Off Season. See the full article here. 100Candles was featured on WeddingIQ with their guest article From a Wholesaler’s Perspective: What We Look for in Prospective Accounts. See the full article here.